Kaala, the Pa Ranjith directorial starring Rajinikanth, has minted over Rs 50 crore at the worldwide box office on its first day. The movie has failed to beat the record of Rajini's previous film Kabali, also directed by Ranjith. Rajinikanth's Kaala witnessed a decent opening at the worldwide box office. With the Tamil movie is getting fairly positive reviews, its collection is expected to improve in the coming days. 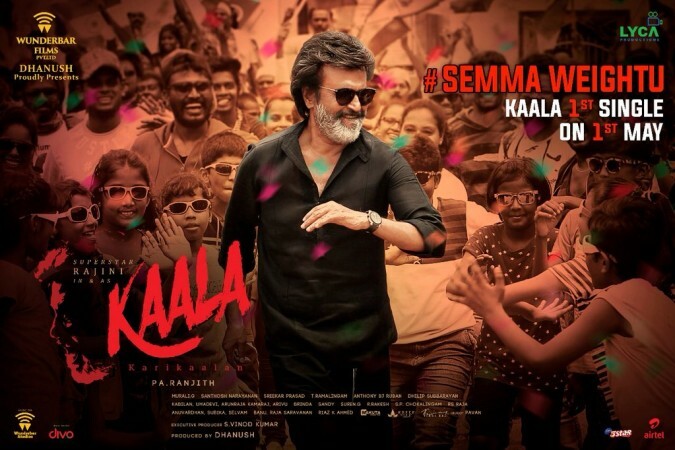 The early estimates by the trade analysts has indicated that Kaala has grossed Rs 40.7 crore at the worldwide box office. It means the Pa Ranjith-directorial has failed to surpass the collection of Kabali, which minted Rs 87.5 crore at the worldwide box office. The projections say the movie to have raked in: Rs 15.4 crore in Tamil Nadu, Rs 5.2 crore in AP/T, Rs 1.5 in Kerala and about Rs 3.5 crore from rest of India. It has grossed about Rs 15.1 crore from the overseas to take its total to Rs 40.7 crore at the worldwide box office on the opening day. The major blow for Kaala came for Kaala in Karnataka where the movie did not release in major parts of the state after pro-Kannada groups stalled the release. Rajinikanth's Kabali had set the new benchmark for the Kollywood movies at the worldwide box office. The huge promotions and good pre-release talk ensured the Kalaippuli S Thanu's film got an earth-shattering opening. In case of Kaala, the makers did not carry out large-scale promotions. Further, the controversy around Rajinikanth's statement on Sterlite gave a negative publicity and there was a call from a section of people to boycott the film. The advance booking gained momentum only after pro-Kannada groups gave a ban call on Kaala in Karnataka and suddenly the movie became a hot topic of debate on TV and social media sites. As a result, the collection, in all the centres including in Tami Nadu, is lesser compared to Kaala. Now, the trade experts are of the opinion that the business would see a growth in the next few days, given the positive reviews from critics and audience. Also, the ban on the film in Karnataka has been lifted.